If you read this post, I talked about how to decorate your school office on a dime. Now that your room is put together, you need to fill it with resources that you can use. Here is a list of 10 no-cost to low cost ideas for getting great resources for your school counseling space. 1. Look at ASCA Scene--this is from the American School Counselor Association and has many great resources that fellow counselors have uploaded to the site to share. 2. Blogs--I blog hop and have subscribed to a large number of blogs. I enjoy reading and seeing what other counselors around the country are doing and the projects they are working on. 3. Livebinders-- As the name suggests, it is an online binder of materials. 4. 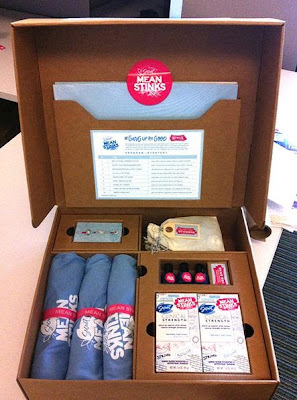 Mean Stinks--brought to you by Secret Deordorant, Mean Stinks is a program to reduce bullying. Email them at endthemean@gmail.com to request your free educator kit. 5. Pinterest. I have mentioned this site in at least a dozen posts. I have found that you don't need to order a dozen activity books to look for great lesson plans, you can look at pictures of the completed projects and copy the ones you are interested in. I have many boards devoted to different ideas, from crafts, group activities, mix it up day ideas, icebreakers, kindness, special needs students, working with teachers, etc. 7. Teachers Pay Teachers-- Exactly as the name implies, this are resources written by teachers (and school counselor) for other teachers (and school counselors). Forget the fancy and expensive workbooks and therapy materials, this site has many free and low-cost materials. What's nice is you can also pick and choose which lessons you want so unlike a workbook where there may be one lesson you want and 9 others you don't, you can buy just what you need! 9. Teaching Tolerance- Get a free magazine, classroom resources, Mix It Up Day ideas, DVDs, etc. I use this site a lot. I love the magazine, have the "Bullied" Movie about Jamie Nabozy (who also came to our school and showed this movie and talked with our 7th and 8th graders--truly awesome! ), and have used plenty of their classroom resources. 10. The Trevor Project-- LGBTQ Resources and information about suicide prevention. The kit is free, but donations are accepted. Very great thing here, this site has many free and low-cost materials.We can definitely choose which lessons we want so unlike a workbook where there may be one lesson we want and others we don't, we can buy just what you need. It is good that schools are back with Technology, like here in this blog schools go with "The Middle School Counselor App". These strategies would bring a new start in the lives of the students which provide dissertation service and they can all use this strategy for the betterment of the others.